Nats320 -- A Washington Nationals Blog: What Was Your Favorite Moment? 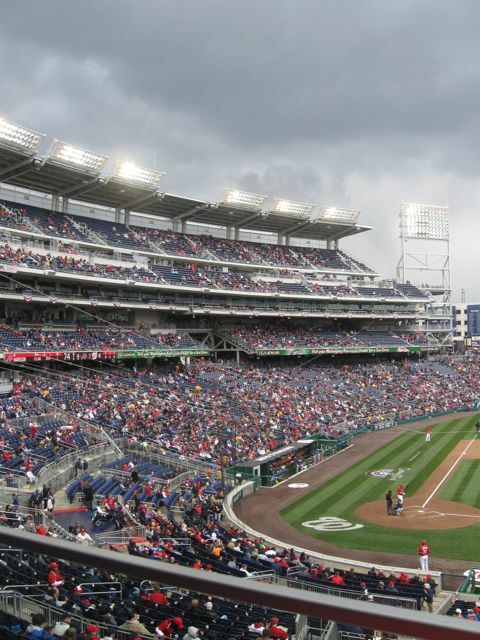 What was your favorite moment from today's twice delayed by rain and hail--ending in whipping wind and freezing temperatures game at Nationals Park? Was it Rick Ankiel's two run homer off Tommy Hanson that sailed over the Out Of Town Scoreboard in the bottom of the third inning that found Ankiel jumping up and down as he crossed home plate galloping into the dugout like a 10 year old? From an enjoyment to watch standpoint--that was precious. 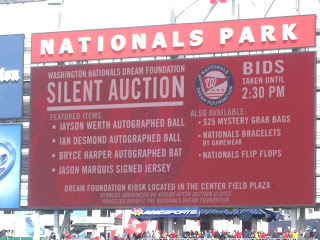 Or was it the fact that as Hanson delivered the fateful pitch to Rick--Ryan Zimmerman (leading off 1st base) ran on a 3-1 pitch with two outs? 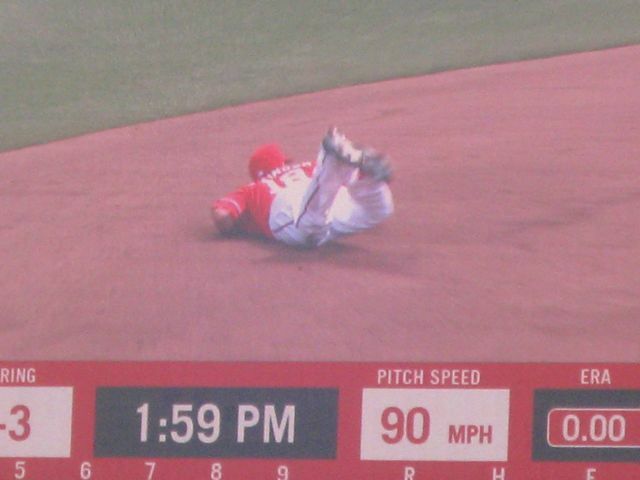 How many times have you seen Our Washington Nationals be so daring early in a tie ball game? 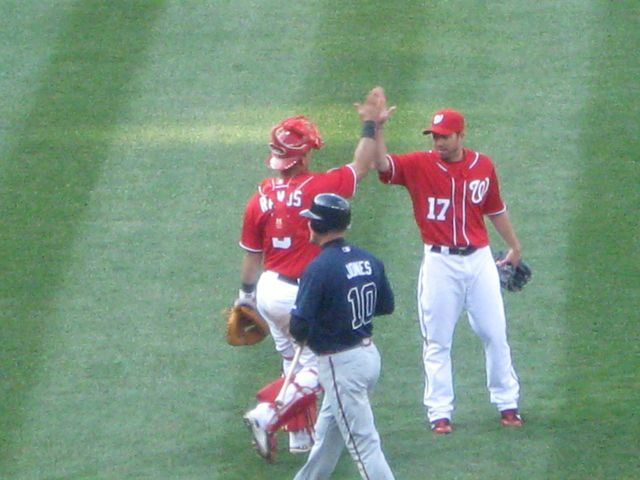 Maybe you enjoyed Danny Espinosa continuing his rather stellar play at 2nd base two games into 2011? In the top of the 2nd he dove to his left to snare a hot grounder off the bat of The Brav-OS Freddie Freeman. As good of a defensive play as you might see in any game. 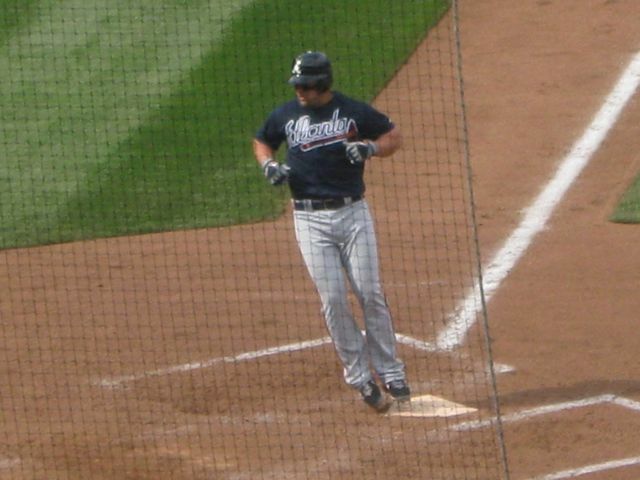 Only to watch "DANO" (as The African Queen now calls Espinosa) one inning later go airborne to his right, backhand grabbing JUST before the baseball hit paydirt--a vicious line drive off the bat of Atlanta's "Pest"--Martin Prado. The Defensive Play Of This Game that found Espinosa protecting his left wrist (the same one he hurt last year) by rolling over his palm of his glove hand as he snatched the baseball out of the air. That was a Big League Play by a rookie with talent and smarts. A Veteran Catch!! 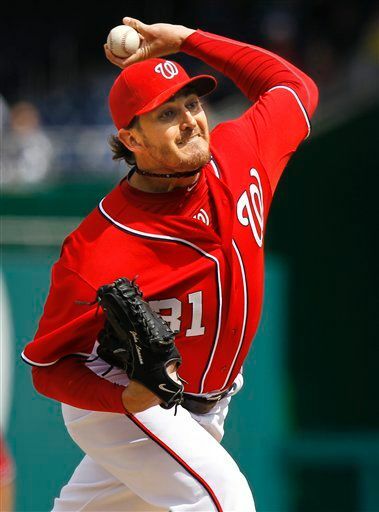 Possibly you also appreciated seeing John Lannan return to the mound for the 5th inning in order to qualify for the win after a one hour rain delay? Did that not give you pause? Atlanta's Tommy Hanson couldn't do so. 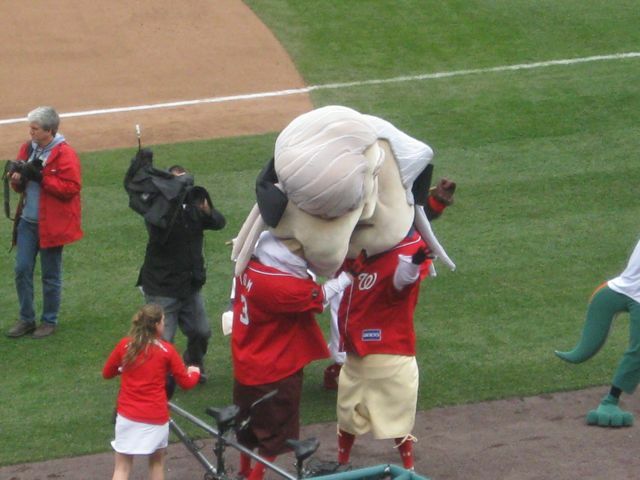 Washington's Southpaw wearing Number 31 somehow did and looked strong doing so. That shows maturity. Forgiving Jayson Werth for his twice turning around, lost in the sun (yes, amazingly the sun did come out today after the second rain delay) misplay of a Freddie Freeman fly ball that landed five feet away on the warming track just in front of Washington Bullpen in the top of the 6th--hasn't New Number 28 wearing D.C. White & Red been impressive in showing ALL of his tools in just two games wearing a Nationals Uniform? 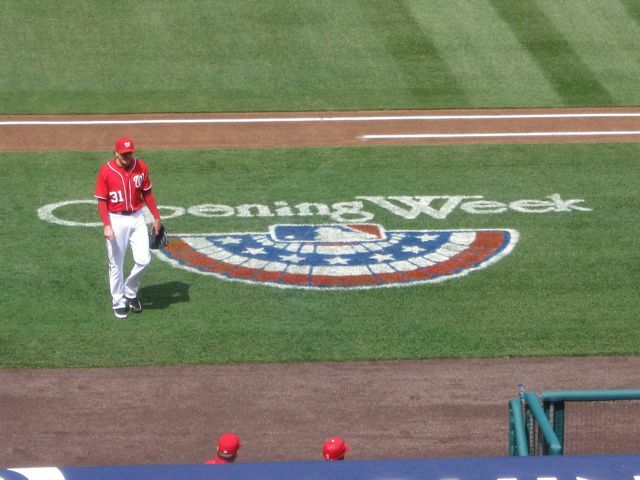 Opening Day--Werth made two fine defensive plays. Today, three hits including a scorching liner to right center in the bottom of the third that looked to be out of the park, but landed three to five feet below the railing. 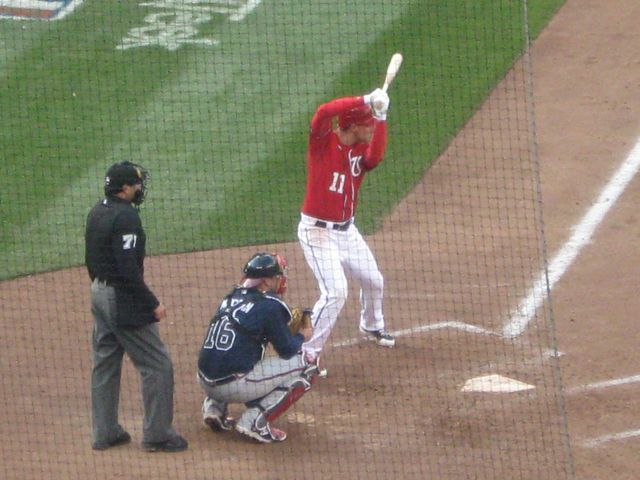 He even added some fabulous base running when he laced a sure single to left center in the bottom of the second and didn't let up rounding first--hustling to second for a double when The Braves' Nate McLouth wasn't quick enough picking up the baseball rolling toward the outfield wall. 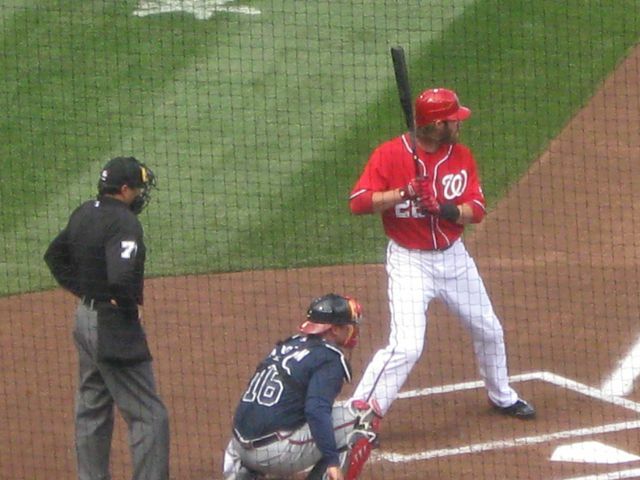 Jayson Werth has been impressive by bringing it strong out of the box. Much like what Rick Ankiel again showed in the bottom of the 8th when he suicide squeezed home Zimmerman with a perfectly placed bunt into the grass in front of home plate and the pitching mound. 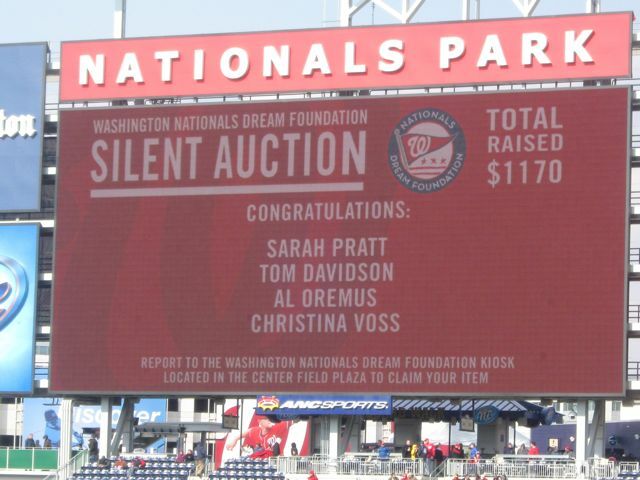 A run scoring sacrifice not seen many times at Nationals Park that brought a huge roar from the announced crowd of 21,941. 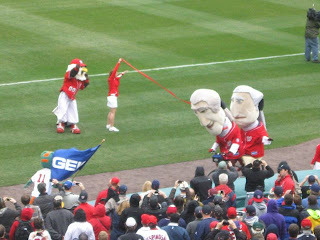 Neither Brian McCann nor George Sherill had any chance for Atlanta to tag Zimmy at the plate. An important insurance run that would NEVER had scored if not for Laynce Nix taking out The Braves' Dan Uggla at second base moments earlier to break up what would have been the inning ending double play. Moment after satisfying moment occurred on South Capitol Street this afternoon. Quality play that did not end until the final out was recorded--thanks to Sean Burnett. Hockey is not a sport Washington's lefty has regularly played, but around 5:20PM this Saturday, Burnett played like a hockey goalie. First swooping down his glove hand to pocket a sharply hit ball right back to the mound by Martin Prado in the top of the 9th. Then ended off this truly well played game by D.C.'s Team by gloving Chipper Jones' hot liner right back to the box. A baseball that was hit top shelf all the way. 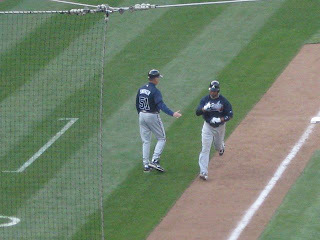 Caught so convincingly by Sean Burnett that he laughed as he high fived his catcher Wilson Ramos in celebration. Those were all the great moments from today's game. 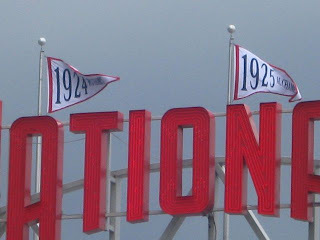 Well that and the sight of watching fans near the left field foul pole and center field plaza run for cover from the fast moving rain and hail approaching the ballpark in the bottom of the 4th. All the while, the game continued briefly as the sky darkened considerably and those sitting near home plate and the first base line--just sat in the their seats watching the game. Very odd. That was terrific too. And fitting for one of the better played games by Washington over the past few seasons. Final score from Nationals Park where incredibly "The Bang!! Zoom!! Of The Fireworks!! 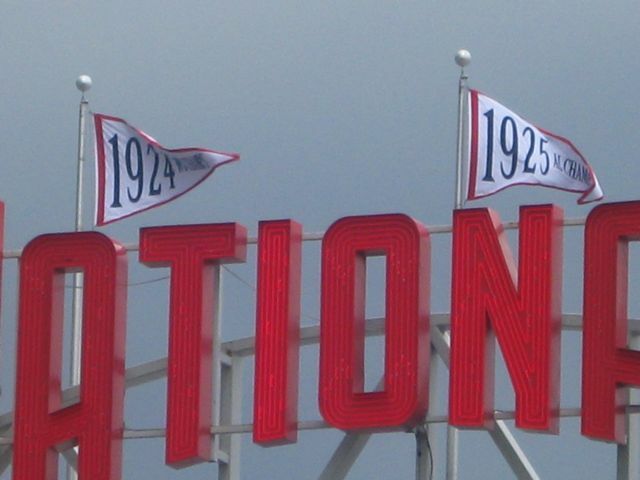 is heard no longer after a Curly "W"--instead a horn? Really, a horn? 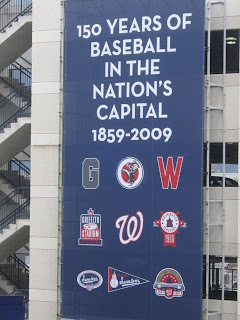 Our Washington Nationals 6 and The Atlanta Braves 3. 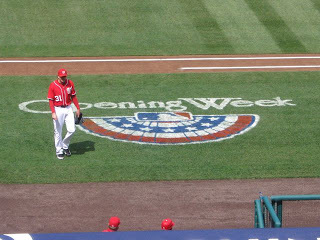 Inning after inning the 2011 Version of D.C.'s team showed a different style of play than seen on South Capitol Street in three previous seasons. 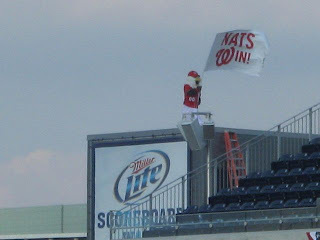 This win was an errorless, complete effort from the mound, in the field and at the plate--proving decisive over one of the National League East's best team. Curly "W" Number One was filled with favorite moments to choose from--timely hitting, solid defense, deft base running, and the joy of executing so perfectly--as was Ankiel's suicide squeeze RBI bunt. 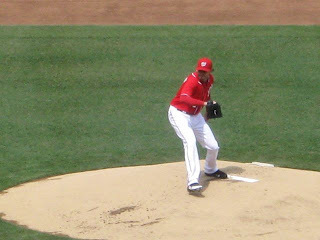 But our most cherished effort we took home this afternoon was Laynce Nix giving up his own body to keep an inning alive so his team MIGHT score something later. That's the hard nose type of play that wins the close games--like the one played today--and many, many more in the future. Nix had saved a run and in doing so may have set the tone for the months to come. Our Washington Nationals showed some growth this afternoon at Nationals Park. The entire 25-man roster went after The Atlanta Braves. 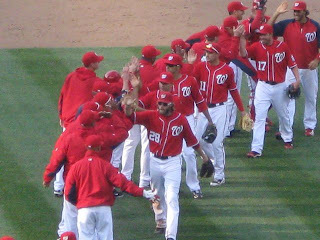 That's a favorite moment we'd love to see throughout the remainder of this fresh and new 2011 baseball season. 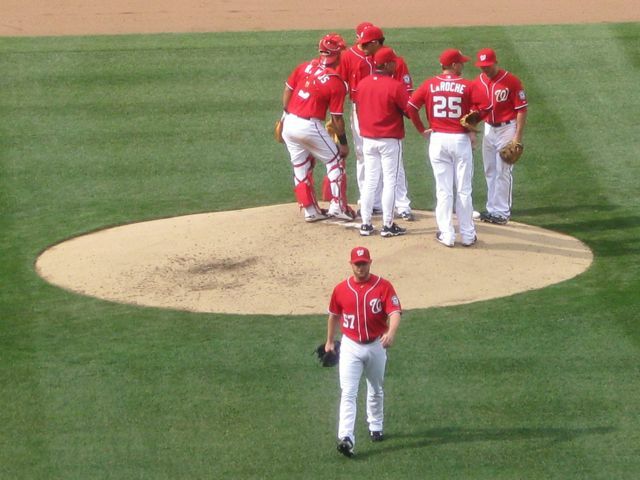 Absolutely stunned to see John Lannan return to the mound after the first rain delay. Early in the season, that was unexpected. 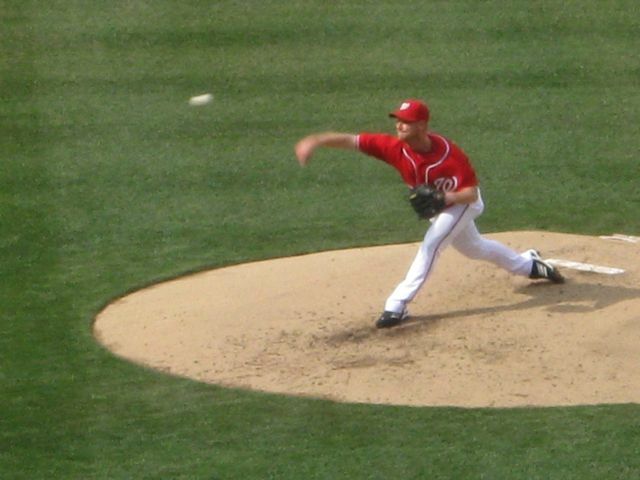 But it turned out well for Washington as Lannan held his own and finished five complete allowing just one run on five hits while striking out three. Gaining his first personal win of 2011, John hung in there when most other pitchers would not for a cold, wet, early April game. 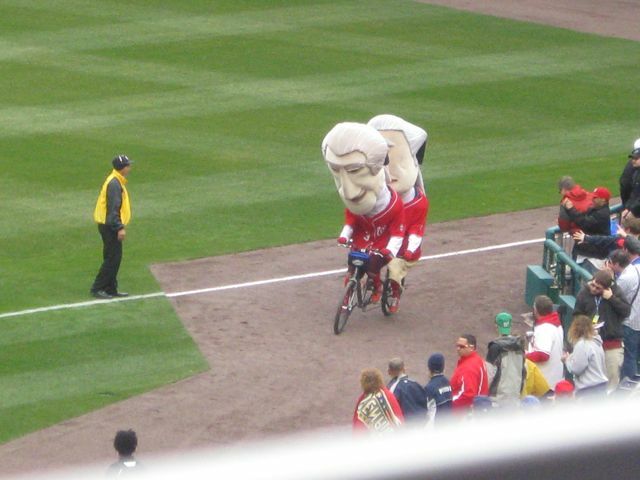 Chad Gaudin had quite the experience in his first appearance in a Washington uniform. Former Marlin and always Nats Nemesis, Dan Uggla, swatted Gaudin's initial offering directly over the left field wall and into the visiting bullpen for a home run. We could see the look of discomfort on Chad's face the second the baseball was hit from Section 218. Not a good start for Gaudin, especially when Our Manager Jim Riggleman relieved him for Doug Slaten just two batters later. Interestingly, Slaten lasted just one batter as Manager Jim then doubled switched when he sent Tyler Clippard to the mound and Nix to leftfield, replacing Michael Morse. Clippard settled the game back down for Washington by pitching 1.2 innings of scoreless relief before Drew Storen entered in the 8th and was taken deep by Atlanta's Alex Gonzalez. A slider over the outside corner of the plate that The Braves' Shortstop (3 for 3 today at the plate) somehow got his bat on and launched out of the park. That was an impressive home run. Sean Burnett, the presumptive closer for Washington gathered his first save in as many opportunities to close this one out. 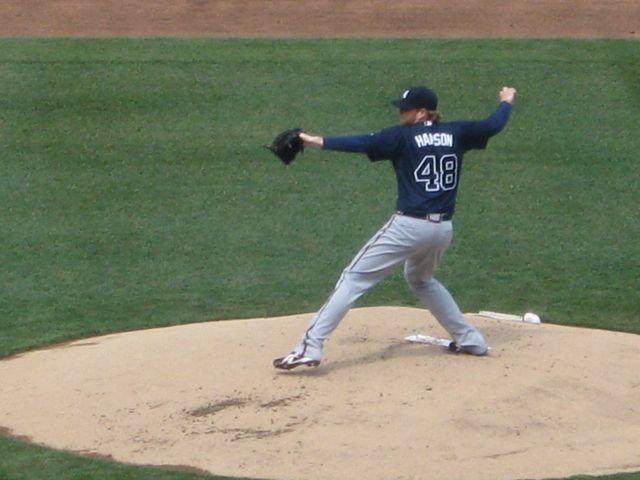 Atlanta's Tommy Hanson was anything but sharp. The Braves top young starter didn't last four innings. 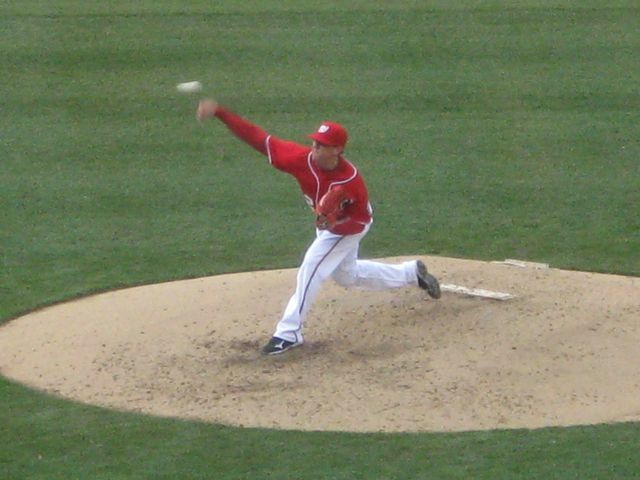 He threw away a pickoff toss to first base that eventually allowed Mikey Mo to score Washington's first run of 2011 on a sacrifice fly by Espinosa in the bottom of the 2nd. He faced 19 batters, seven of them reached, four of them scored. 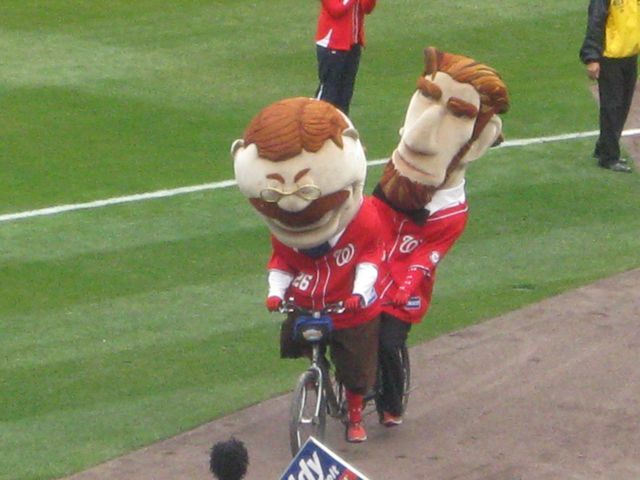 And Hanson didn't return when the rains began with Jayson Werth at the plate in the bottom of the 4th. Werth had three hits (two doubles) and scored one run. Zimmerman had two hits, walked, scored two runs and knocked in his first run of 2011. 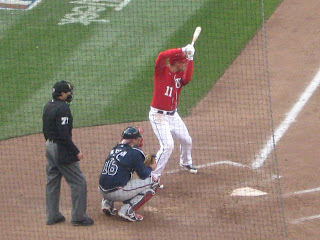 In his first start of the season, Wilson Ramos slapped out three hits and showed behind the plate his capabilities. Three times we counted Ramos quickly getting to his knees to block a Lannan pitch in the dirt. 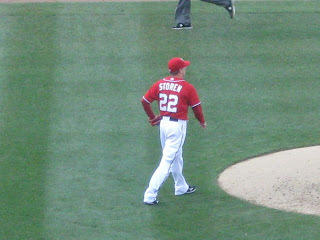 His throwing arm displayed on a sacrifice bunt by Hanson in the top of the 4th wasn't bad also. Picked by Jim Riggleman as his centerfielder, Rick Ankiel knocked in two runs with his home run scoring Zimmy before him in the 3rd and The Z-Man again in the bottom of the 8th on that terrific suicide bunt. Ankiel producing some good baseball you had to appreciate. Three times this afternoon, Manager Jim came out of the home dugout to argue umpiring calls. 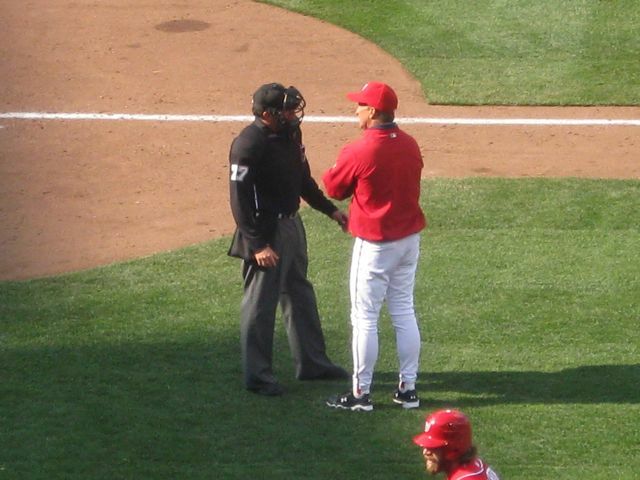 Three times he didn't win any of the arguments, but Riggleman made a point of protecting his players--publicly. 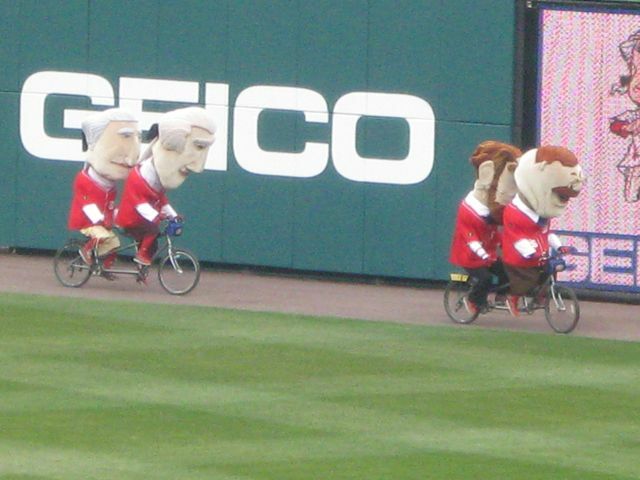 In another tandem race, this time on bicycles, George and Tom defeated Abe & Teddy pretty handily. 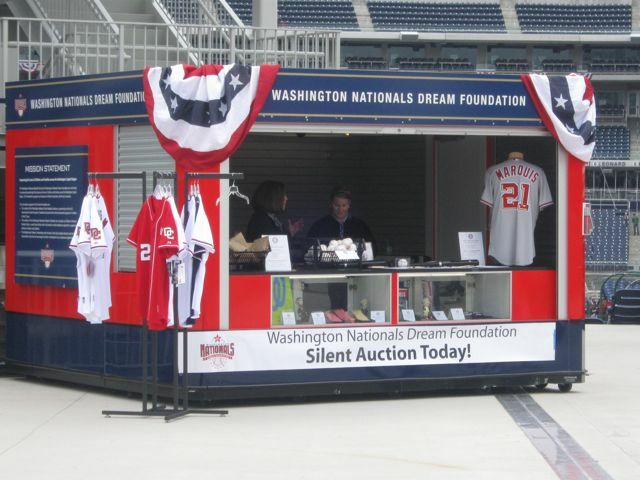 As is the case for every Saturday home game, The Washington Nationals Dream Foundation held their first silent auction of 2011. Up for grabs today were signed baseballs from Jayson Werth and Ian Desmond, as well as, a Bryce Harper autographed bat and Jason Marquis Jersey. 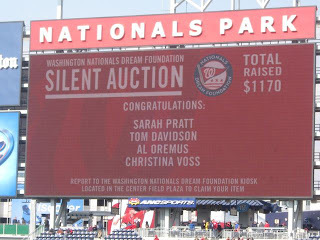 Today's bids garnered $1170 for Our Washington Nationals charitable arm. 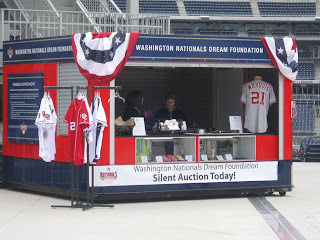 Before the game, Sohna and I purchased game worn Josh Willingham (Home) and Luis Atilano (Away) jerseys from a selection available off the rack at the Dream Foundation Kiosk in Center Field Plaza. Both jerseys were authentic cool base jerseys. Additionally, we picked up a Jesus Flores signed baseball. The exterior of the ballpark running from South Capitol Street around Home Plate Gate to Potomac Avenue to 1st Street SW has been completely repainted in two tones of gray. The Sony Playstation in the Kids Zone in Center Field Plaza is no longer. 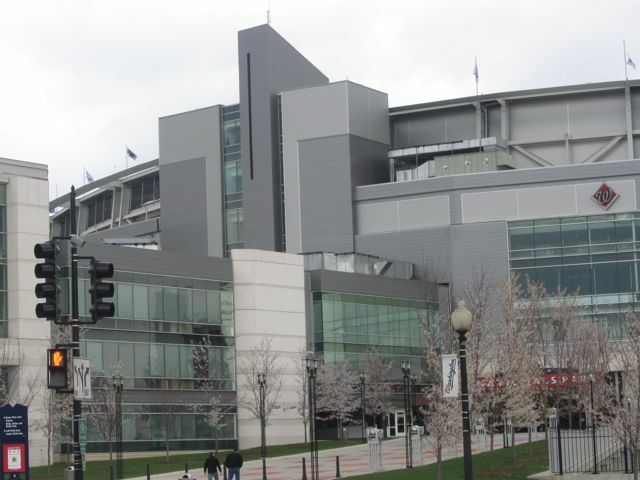 After their three year commitment came to a close after the end of the 2010 season, Sony decided not to re-up for another year. 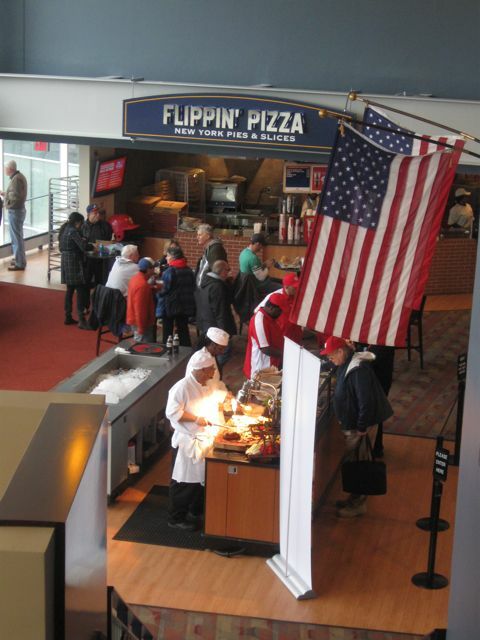 The lounge furniture that used to be at the Miller Lite Scoreboard Walk has been placed inside this area which now includes two large HD TV screens. Love the banner placed on Garage B that acknowledges all previous professional baseball teams and stadiums that called Washington D.C. their home. 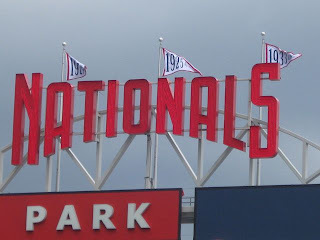 The Washington Senators/Nationals American League & World Series Championship Flags above the HD Scoreboard are bigger, brighter and easier to read in 2011. 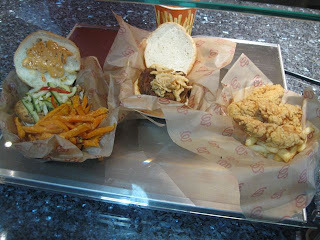 Jerk Chicken Sandwich, Braised Short Rib and Sweet Potato Fries at the Anacostia Station. 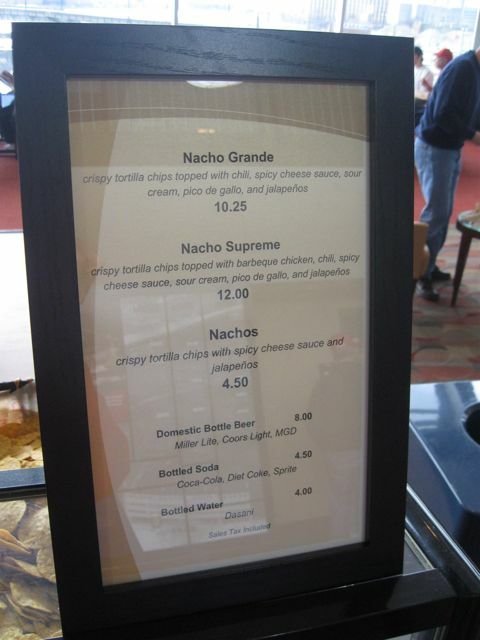 Supreme Nachos with BBQ chicken for $12.50 at the Nachos Stand behind Section 218. 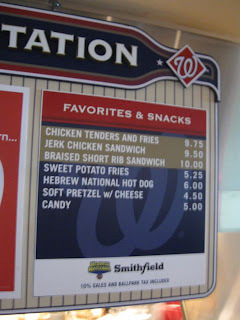 The Carving Station behind Section 216 (next to Flippin Pizza) has reduced their prices for Sandwiches $2 for 2011. We also got a kick out of the questions and sentences printed on the back of service staff employees this year at Nationals Park. 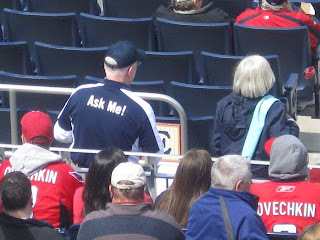 Some of the ushers have the phase: "Ask Me!" 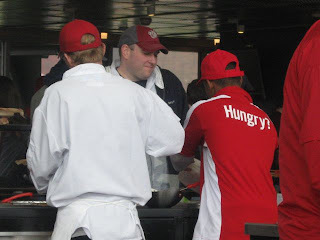 Food service staff have the phrase: "Hungry?" And roving concession workers have the phrase: "Eating is not a spectator sport." Sort of funny and pretty noticable. Usher staff no longer wearing yellow dress shirts but blue polos with white sleeves and Curly "W" on the left breast pocket. And finally, isn't "Bang!! Zoom!! Go The Fireworks!! 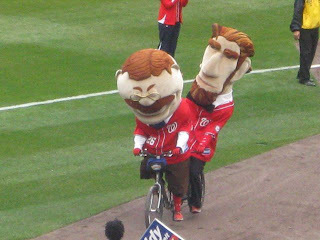 after a Washington Nationals home run or win one of the few baseball traditions intrinsic to Our Washington Nationals? 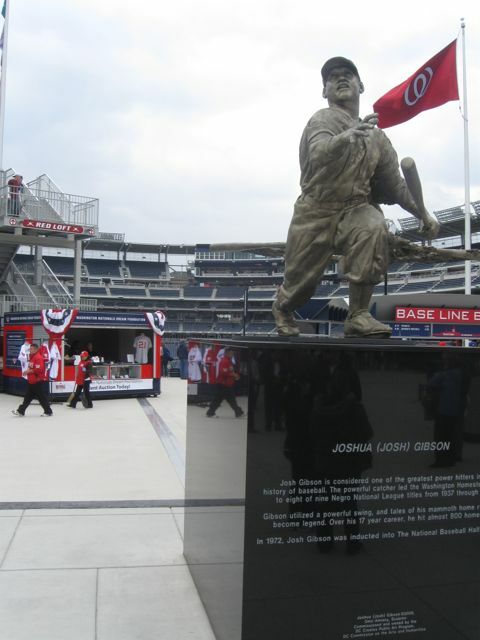 Started by Radio Broadcaster Charlie Slowes in 2005 when fireworks were shot off after home runs and wins at RFK Stadium--it became an iconic phrase that baseball fans recognize as D.C. Baseball. Why are we getting rid of a naturally born tradition? Haven't The Washington Capitals embraced a horn from a fan at their games? Why copy that when we have something all our own? I'm glad you brought up the horn/fireworks issue. I kept thinking to myself yesterday, "Something is Different," after the win. Now I know what it was! And what was the song that they played? Toronto Blue Jays fan here looking for some info. In June I'll be headed down to Nationals Park for a game and I was hoping to get some tips on stuff to see, food to try, etc. Anywhere in the park that's a bit better to sit than other sections? 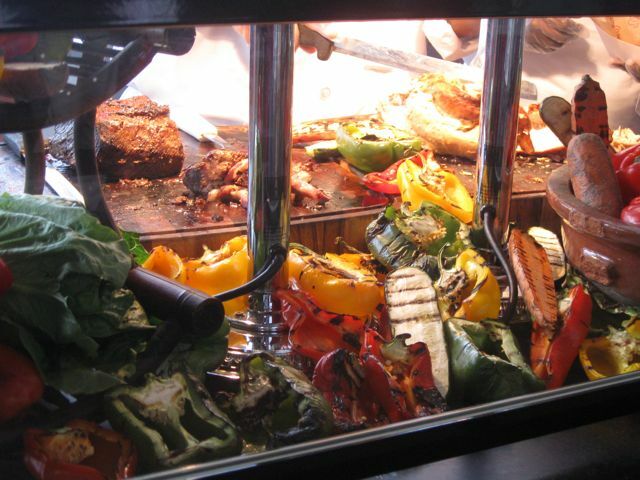 Any food I should be sure to try (or avoid)? Any bars or restaurants around the park that would be good to go before/after the game? Anything you can tell me that can help me get the full Nats experience would be much appreciated. 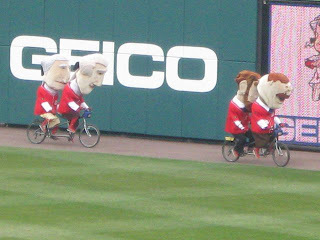 Thanks, and good luck in the 2011 season! Mad Hatter: There are virtually no bars or restaurants around the ballpark as development has stagnated during the recession except for a small but the always crowded BeerPen located just across the street from Center Field Plaza (stadium's main entrance). It's an open air bar situated around a construction zone. A local hamburger favorite Five Guys is located two blocks away near the Metro Station. 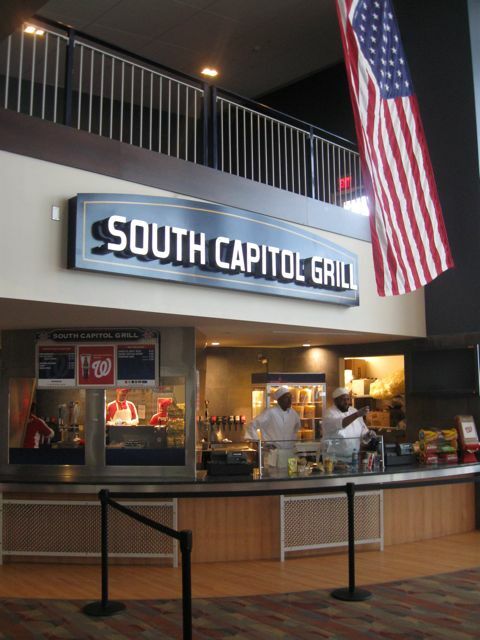 Five Guys had a stand inside Nationals Park until this year but no longer. Bens Chili Bowl is another local favorite with a main stand on the 3rd base concourse of the park and smaller locations throughout the park. In left centerfield sits The Red Loft which is an open air bar that stays pretty packed throughout every game. 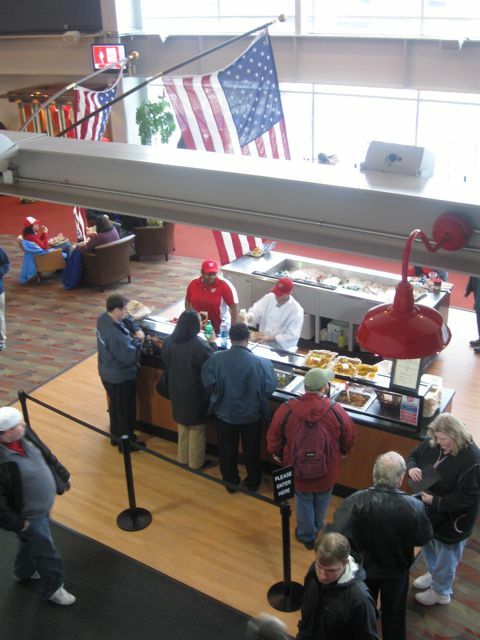 Standing room only, it overlooks the field and is a local game time hangout. 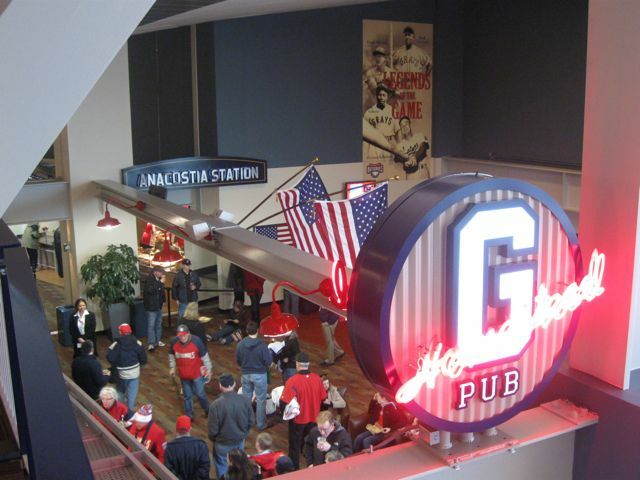 The Miller Lite Scoreboard Walk is situated under the main scoreboard in right center. 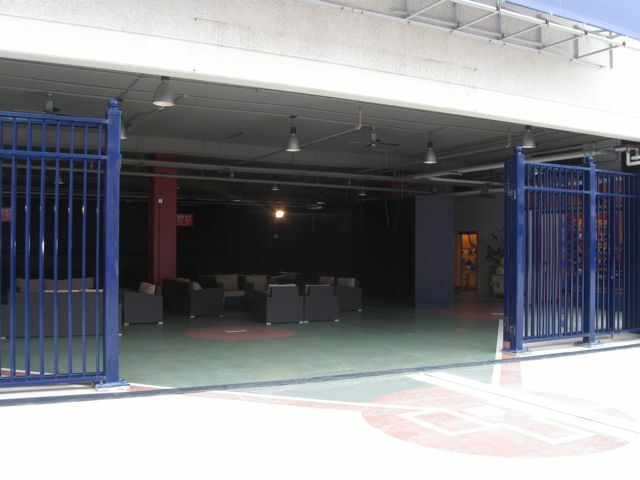 An open air bar that has happy hour for thursday, friday and saturday games. 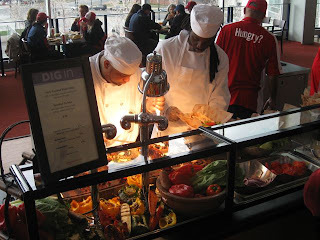 If you are looking for a good view of the game, the Infield Club Seats allow for a nice vantage point. There only only about 12 rows in each section. Easy in and out with an climate controlled interior club with two full bars and food concessions not available in other parts of the park. Both Presidents Club & Diamond Club seats can be pricey but include free beer/wine and food. 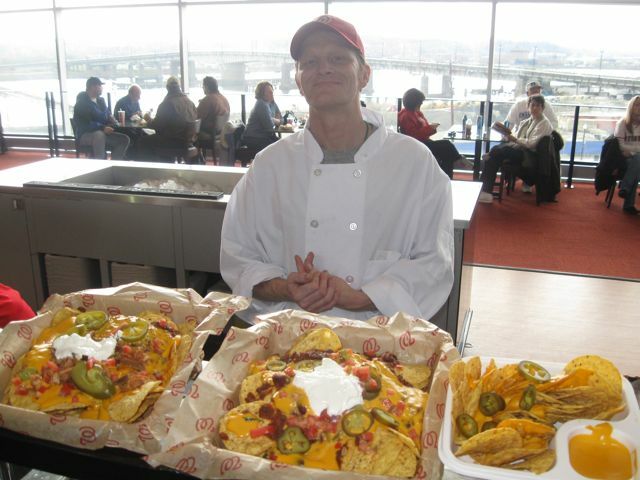 Not just ballpark food but a sit down meal and concessions at your seat all game long. All Club level seating is open until 45 minutes after every game. If you like to sit close, the infield box seats are very close to the playing field. 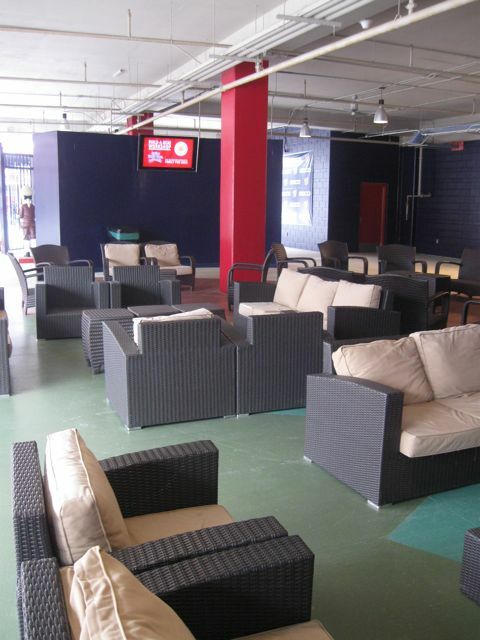 Many visiting fans tend to sit in these seats located on the 3rd base side of the park--which is the visiting dugout. Hope that helps in your visit to Washington. 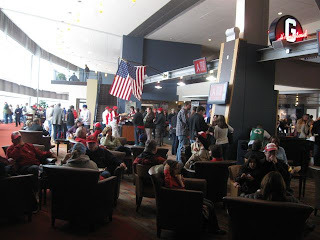 1) Fanfest-seeing Frank Howard in not one, but two Q&A sessions! In the second one he told Bryce Harper that there was one record he would never break. He then launched into the story he had told in the earlier session of the day he had six strikeouts and then hit into a double play. It was just as entertaining the second time. 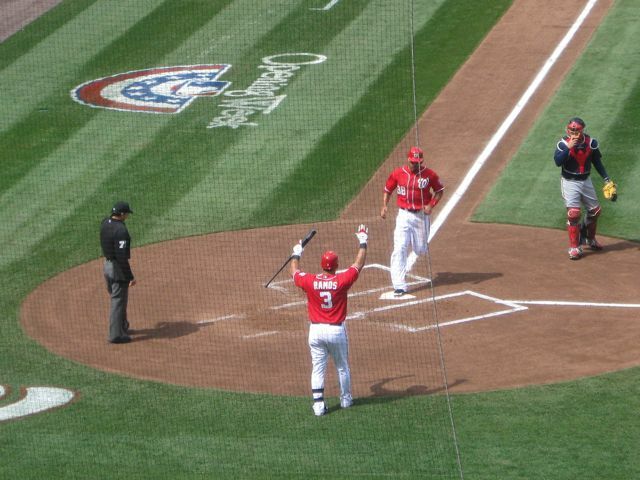 I was very impressed with Bryce Harper. He handled himself very well in the Q&A, very likeable. Seeing the former slugger and the up and comer sitting next to each other was great! 2) Being back at Nationals Park for baseball on Opening Day! 3) Seeing Livo strike out McLouth the next time he came up after the at-bat in which he pretended to have been hit by the pitch. I could have sworn I heard the ball hit the bat. 4) The win on Saturday coming after one rain delay and one rain/hail delay! This was my first time being hailed on at a baseball game. Not much fun but definitely memorable. One more favorite thing, the perfectly executed squeeze play! @ Screech... Thanks for all the info. Bought my tickets last night and decided to go for a slightly loftier perch. 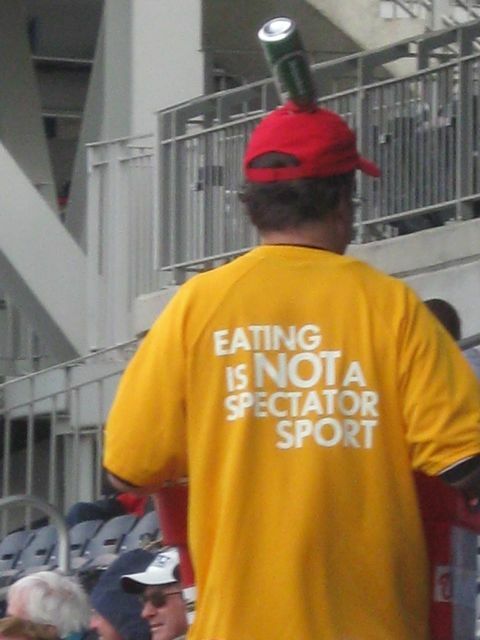 Gonna sit up in section 225. Is that way out in God's country, or will it make for a half decent vantage. Oh, and given that I'm headed to an afternoon game, should I pack extra sunblock or is there any shade to be had in that corner (I imagine daytime games in June can get a bit sweaty). The Mad Hatter: 225 is a pretty good section, just down the right field line--slightly above the field of play. Good sightlines. In the late afternoon, early evening during late spring and summer, the sun sets on those seats from basically Section 219 through the right field stands. There is some shade--mostly in the rear of those sections though. sunblock not a bad idea during summer day games. the sun can be brutal. Sorry man - *one* last question for ya. I'm trying to settle on where to book a hotel and find myself tripping over what's gonna be the best choice. 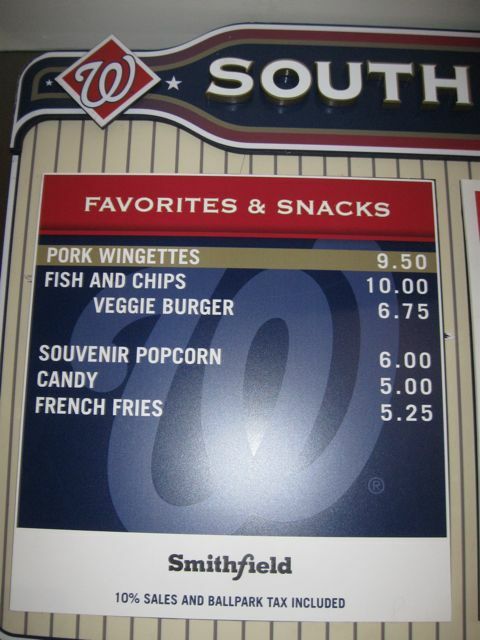 I *don't* need to stay right next to the ballpark. I *do* want to be reasonably close to the Metro line. Reasonable access to the usual sights (The mall, etc) is a plus. And I'm looking for an area where there are bars/restaurants/things to do close by. Suggestions for a neighbourhood/area of the city? Thanks for all of the info so far man - you've been amazingly helpful. 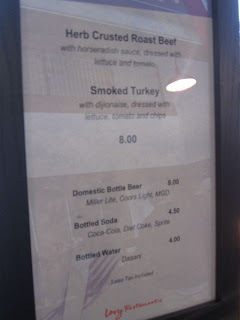 Bars/Restaurants nearby--Capitol Hill. 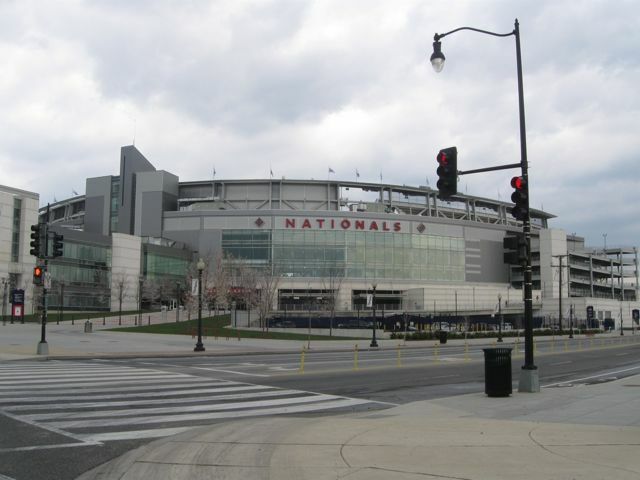 New Jersey Avenue & D Street Hotels are near Union Station Metro. Capitol and The Mall walking distance away. 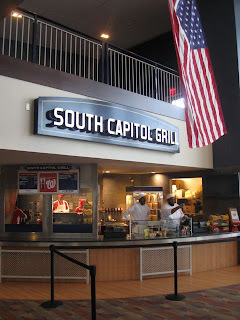 Capitol South Station is on the House side of the Capitol Grounds and Pennsylvania Ave. NE. Many old time Washington favorite bars are near here. Foggy Bottom Metro--near GW University is on the west end of town--near many, many hangouts and a short walk to Georgetown. W Hotel on 15th right across the street from Treasury and the White House. 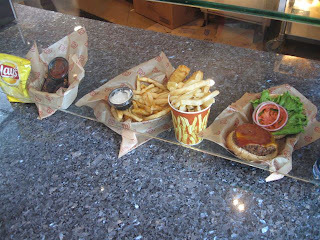 Famous Old Ebbett Grill one block away--North. McPherson Square Metro two blocks away. Georgetown does not have a Metro Station but the Circulator Bus runs to and from there to Union Station for just $1 (all the way across town)--making access pretty easy and convenient still.